Vertebrates acquired dim-light vision when an ancestral cone evolved into the rod photoreceptor at an unknown stage preceding the last common ancestor of extant jawed vertebrates (∼420 million years ago Ma). The jawless lampreys provide a unique opportunity to constrain the timing of this advance, as their line diverged ∼505 Ma and later displayed high-morphological stability. We recorded with patch electrodes the inner segment photovoltages and with suction electrodes the outer segment photocurrents of Lampetra fluviatilis retinal photoreceptors. Several key functional features of jawed vertebrate rods are present in their phylogenetically homologous photoreceptors in lamprey: crucially, the efficient amplification of the effect of single photons, measured by multiple parameters, and the flow of rod signals into cones. These results make convergent evolution in the jawless and jawed vertebrate lines unlikely and indicate an early origin of rods, implying strong selective pressure toward dim-light vision in Cambrian ecosystems. The eyes of humans and many other animals with backbones contain two different types of cells that can detect light, which are known as rod and cone cells. Rod cells are much more sensitive to light than cone cells. The rods allow us to see in dim light by amplifying weak light signals and transmitting information to other cells, including the cones themselves. It is thought that the rod cell evolved from the cone cell in the common ancestors of mammals, fish, and other animals with backbones and jaws at least 420 million years ago. Lampreys are jawless fish that diverged from the ancestors of jawed animals around 505 million years ago, in the middle of a period of great evolutionary innovation called the Cambrian. They have changed relatively little since that time so they provide a snapshot of what our ancestors' eyes might have been like back then. Like the rod and cone cells of jawed animals, the eyes of adult lampreys also have two types of photoreceptors. However, it was not clear whether the lamprey photoreceptor cells work in a similar way to rod and cone cells. Asteriti et al. collected lampreys in Sweden and France during their breeding season and used patch and suction electrodes to measure the activity of their photoreceptor cells. The experiments show that the short photoreceptor cells are more sensitive to light than the long photoreceptors and are able to amplify weak light signals. Also, the short photoreceptors send signals to the long photoreceptors in a similar way to how rod cells send information to cone cells. The similarities between lamprey photoreceptor cells and those of jawed animals support the idea that they have a common origin in evolutionary history. Therefore, Asteriti et al. conclude that the ability to see in low light evolved before these groups of animals diverged about 505 million years ago. The picture that emerges is one in which our remote ancestors inhabiting the Cambrian seas already possessed dim-light vision. This would have allowed them to colonize deep waters or to move at twilight, an adaptation suggestive of intense competition or predation from other life forms. The fossil record shows that by the middle Cambrian, camera-type eyes were already present in stem vertebrates (Morris and Caron, 2014), supporting the emerging concept that spatially resolved vision provided a major competitive advantage in those biota (Paterson et al., 2011). Lampreys, the only surviving jawless vertebrates together with the related hagfish (Heimberg et al., 2010), are a pivotal resource for gaining further insight into early vertebrate vision. In fact, their line diverged during the Cambrian (∼505 Ma [Erwin et al., 2011]) and they later remained remarkably stable. This is true both of their external morphology, as revealed by fossil specimens (Janvier and Arsenault, 2002; Gess et al., 2006; Janvier et al., 2006; Chang et al., 2014), and of their anatomy, as demonstrated by primeval features such as the absence of bilateral limbs and of myelinated axons, and by their possession of the simplest nervous system among vertebrates. Adult lampreys have camera-type eyes with layered retinas containing all the major neuronal classes present in jawed vertebrates (Lamb, 2013) and sending retinotopically organized projections to the tectum (Jones et al., 2009), as well as a photosensory pineal organ (Pu and Dowling, 1981). Researchers have debated the rod or cone nature of lamprey retinal photoreceptors since the middle of the 19th century (relevant literature reviewed by Walls, 1935; Govardovskii and Lychakov, 1984; Collin et al., 2009) to ascertain whether, in vertebrates, cones pre-dated rods or vice versa. Current molecular genetic evidence indicates that modern rods evolved from an ancestral cone (Okano et al., 1992; Yokoyama, 2000; Lamb et al., 2007; Kawamura and Tachibanaki, 2008; Shichida and Matsuyama, 2009), implying that vision in near darkness is a relatively recent acquisition (Lamb, 2013) and causing the point of contention to become that of the timing of rod evolutionary emergence. This advance must have occurred (i) after the appearance of the precursor of rhodopsin and of other rod-specific phototransduction proteins isoforms and (ii) before the initial diversification of extant jawed vertebrates (∼420 Ma; Erwin et al., 2011) endowed with modern rods. Phylogenetic analysis of visual opsins constrains time bound i to have occurred anywhere between the divergence of ascidians (∼610 Ma; Erwin et al., 2011) and that of the lamprey line (∼505 Ma; Erwin et al., 2011): the sea squirt Ciona intestinalis has only one jawed vertebrate-related visual opsin (Kusakabe et al., 2001), while some lamprey species have all five major classes (Yokoyama, 2000) including an Rh1 rhodopsin ortholog (Pisani et al., 2006) (but see Collin et al., 2003). Recently, strong evidence has emerged indicating that these five opsin classes (and the rod-specific molecular toolbox) emerged in the context of two rounds of whole-genome duplication called ‘2R’ (Kuraku et al., 2009; Lagman et al., 2013). Furthermore, analysis of the whole sea lamprey genome suggests that the lamprey line diverged from the main vertebrate line shortly after 2R (Smith et al., 2013). Therefore, unveiling the functional properties of lamprey photoreceptors may shed light on the evolution of dim-light vision in the critical time period following 2R (Collin et al., 2009; Lamb, 2013). The two types of photoreceptors in the retina of Northern hemisphere lampreys have light-absorbing outer segments arranged in adjacent tiers (Figure 1A): those of short photoreceptors (SPs) lie in an inner tier, while those of long photoreceptors (LPs) lie in an outer tier, next to the pigment epithelium. This nomenclature is based on the entire length of the photoreceptors that of the outer segments showing instead the reverse pattern. Importantly, SPs express an Rh1 rhodopsin ortholog (Pisani et al., 2006) and some of their phototransduction protein isoforms examined thus far clade with those of rods (Muradov et al., 2008), but they also have molecular and morphological features of cones including outer segment discs that appear continuous with the plasma membrane (Dickson and Graves, 1979). Thus, while they retain archaic features of a cone progenitor, SPs are homologues of jawed vertebrate rods (Lamb, 2013). LPs, on the other hand, express an LWS red cone opsin and have a molecular fingerprint consistent with cones (Muradov et al., 2008). Here, we examined single lamprey photoreceptors at the levels of their inner and outer segments using two different recording techniques that provide complementary information, to establish the extent to which SPs operate like jawed vertebrate rods. We found multiple striking similarities that, taken together, argue against convergent evolution, implying that middle Cambrian vertebrates possessed functionally advanced rod precursors. Signal processing in the inner segment of lamprey photoreceptors resembles that found in jawed vertebrates. (A) Image of a live retinal slice showing the layered organization of lamprey photoreceptors: short photoreceptors (SPs) in an inner tier and long photoreceptors (LPs) in an outer tier. Scale bar 10 µm. (B) Photoreceptors express the Ih current: membrane current of a SP in response to hyperpolarizing voltage clamp steps (from a holding potential of −53 mV to −60/−67/−74/−81/−88/−95/−102/−109 mV and repolarization to −65 mV) in control and during superfusion of the Ih blocker ZD7288 at 100 µM. Records are not averages. (C–F) Photovoltage responses reveal that SPs feed their signals into LPs. (C and D) Average responses to 520-nm flashes of a SP (0.5, 1.6, 5.4, 15, 45, 136, 398, 1128 photons·µm−2) and a LP (16, 51, 170, 469, 1413, 4314, 12,597, 38,847, 77,695 ph·µm−2). Insets show their outer segments (scale bars 5 µm). (E and F) Response amplitudes to 520-nm (green circles) and 590-nm flashes (orange circles with a dot) of a SP and a LP. Fits are exponential saturation functions (for the LP restricted to the first component: see text). In panel E, left and right ordinate values refer to left and right data sets, respectively, which were adjusted to match saturating amplitudes. In panel F such an adjustment could not be performed. Error bars are SEM. Action spectra templates for SPs and LPs are shown in Figure 1—figure supplement 1. Using Lampetra fluviatilis, collected in Sweden and France during their spawning run, we investigated the function of photoreceptors in retinal slices maintained at a physiological temperature of 9–11°C. First, we made perforated patch-clamp recordings from photoreceptor inner segments and found that the dark membrane potential was of −43.2 ± 0.7 mV for SPs (n = 30) and −45.9 ± 1.1 mV for LPs (n = 10) (Table 1); these values are in line with those of jawed vertebrate rods and cones (Cangiano et al., 2012). Input resistances were 518 ± 41 MΩ (n = 8; SPs) and 442 ± 68 MΩ (n = 9; LPs). The membrane time constants, obtained by fitting single exponentials to the early rise of a current step response, were 31.9 ± 4.9 ms (n = 8; SPs) and 12.9 ± 1.3 ms (n = 9; LPs) (p < 0.001), equivalent to low-pass filtering with cut-off frequencies of ∼5 Hz for SPs and ∼12 Hz for LPs. Thus, the electrical properties of the inner segments of SPs seem adapted to process slower photocurrent changes than those of LPs. 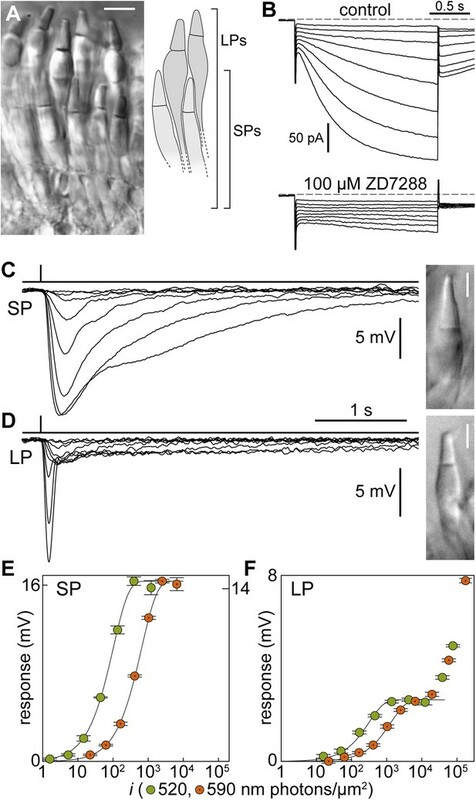 Both SPs (n = 7) and LPs (n = 2) expressed the hyperpolarization-activated current Ih, similarly to rods and cones (Della Santina et al., 2012); Ih was abolished by ZD7288 (100 µM, n = 1 SP; Figure 1B). Values are given as ‘mean ± SEM (sample size) [statistical significance]identifier letter’; n.s. : not significant; *p < 0.05; **p < 0.01; ***p < 0.001; Vdark: dark membrane potential; IRmembrane: input resistance; τmembrane: membrane time constant; i1/2: half-maximal response flash strength; TTP: time-to-peak; τrec: decay time constant; a: absolute single photon response; a%: fractional single photon response; SNR: signal-to-noise ratio; Idark: dark current; SPs: short photoreceptors; LPs: long photoreceptors. Light stimulation evoked a hyperpolarization in both photoreceptors (Figure 1C,D), with peak changes in membrane potential of up to 30 mV (SPs) and 32 mV (LPs) in response to saturating flashes. The amplitudes of the flash responses from SPs were described by exponential saturation functions (Figure 1C,E). From the curves, we obtained a ratio of 4.4 ± 0.9 (n = 5) for the sensitivities of these photoreceptors at 520 nm and 590 nm. This value is in reasonably good agreement with the ratio of 5.6 predicted by an 11A1 visual pigment template (Govardovskii et al., 2000) having a λmax of 517 nm (Figure 1—figure supplement 1A), the absorbance maximum of SP outer segments found with microspectrophotometry (Govardovskii and Lychakov, 1984), and is thus consistent with the expression of an Rh1 visual pigment. For LPs, the flash responses displayed two components (Figure 1D,F): the first component had kinetics, sensitivity, and spectral preference similar to SPs; the second component had faster kinetics, lower sensitivity, and a ratio of sensitivities at 520 nm and 590 nm of 1.1 ± 0.04 (n = 6). This ratio agrees with the value of 1.1 predicted by an 11A1 template (Govardovskii et al., 2000), whose λmax is set at 555 nm (Figure 1—figure supplement 1A), the absorbance maximum of LP outer segments (Govardovskii and Lychakov, 1984), consistent with their expression of an LWS pigment. It is likely that the first component of the flash response from LPs represents input from SPs, probably mediated by gap junctions; this arrangement would represent in lamprey retina an arrangement homologous to rod-cone coupling in jawed vertebrates (Asteriti et al., 2014). In support of this interpretation, we observed with Lucifer Yellow injection thin telodendria emanating from the synaptic pole of the photoreceptors and extending laterally into the inner plexiform layer (Figure 2): the only known function of these processes in jawed vertebrates is that of forming inter-photoreceptor junctional contacts (O'Brien et al., 2012). We attempted to uncouple these cells pharmacologically with MFA (100 µM) or 2-APB (10–20 µM), known blockers of retinal gap junctions, but unfortunately these agents produced marked non-specific effects (not shown). Lamprey photoreceptors extend telodendrial processes. 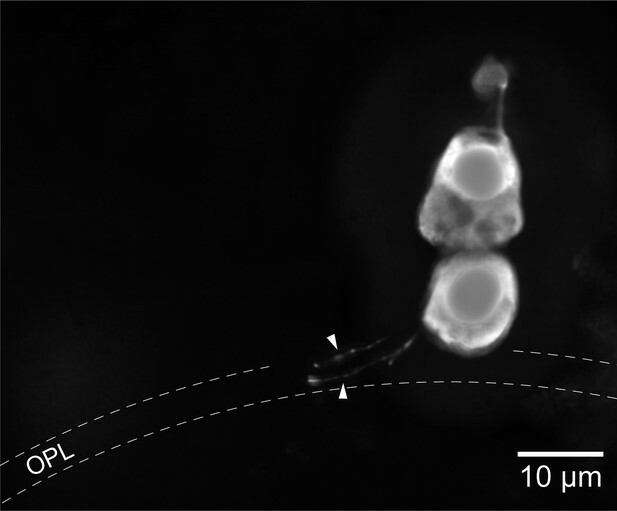 An example of a lucifer yellow stain of a live SP showing two thin processes (arrowheads) extending laterally from the synaptic pole into the outer plexiform layer. During their spawning run, lampreys do not feed and rely exclusively on stored reserves for several months, leading to a vitamin A deficiency (Wald, 1942) that could hinder visual pigment regeneration. We thus wondered whether some of the visual pigment in our preparations might have been in a bleached state (i.e., devoid of its light-sensing chromophore). Clarifying this point was a crucial prerequisite to our subsequent assessment of single photon processing by SPs, for reasons explained in the rest of this paragraph. In jawed vertebrates, bleached rod and cone opsins constitutively activate the phototransductive cascade at a very low rate (Cornwall and Fain, 1994; Cornwall et al., 1995). Due to this property in rods, in which pigment regeneration is much slower than in cones, bleaches of even a small fraction of the total pigment pool caused by bright light lead to a significant and long-lasting desensitization, which is much larger than what is expected from the simple decrease in light-sensitive visual pigment molecules (Fain et al., 2001; Lamb and Pugh, 2004). Bleaching desensitization thus leads to a reduction in phototransduction gain, and therefore, in the single photon response amplitude. Assuming that lamprey opsins behave similarly to those of jawed vertebrates, the possible presence of bleached visual pigment in our experiments (see above) raises the possibility that SPs were desensitized relative to their full potential. To examine whether this was the case, we regenerated any bleached visual pigment molecules by superfusing the retinal slices in the recording chamber with the artificial analog 9-cis-Retinal (100 µM for 20–25 min). The sensitivity at 520 nm of two SPs, recorded both in control and during delivery of 9-cis-Retinal, increased by 2.0 and 2.5-fold (Figure 3A). Moreover, sensitivity was higher (p < 0.01) in regenerated than in control SPs: half-maximal response at 520 nm evoked with flashes (i1/2) of 63 ± 11 photons·µm−2 (n = 12; regenerated) vs 149 ± 25 photons·µm−2 (n = 10; control). Thus, some of the visual pigment molecules in SP outer segments were indeed bleached. The ratio of sensitivities at 520 and 590 nm did not differ significantly (p = 0.42) between regenerated and control SPs: 5.6 ± 1.0 (n = 5; regenerated) vs 4.4 ± 0.9 (n = 5; control). To test whether such bleaching was associated to desensitization, we examined dim-flash integration time (Jones et al., 1996). In one SP, integration time increased by 2.6-fold after superfusion with 9-cis-Retinal and the same parameter was significantly higher (p < 0.001) in regenerated than in control SPs (Figure 3B): 0.81 ± 0.14 s (n = 9; regenerated) vs 0.32 ± 0.05 s (n = 13; control). These results strongly suggest that SPs were in a state of bleaching desensitization. Visual pigment regeneration reveals the full sensitivity of photoreceptors in the upstream migrating river lamprey. (A) Photovoltage response amplitudes to 520-nm flashes before (gray circles) and after visual pigment regeneration with 9-cis-Retinal (red circles with a dot) of a SP. Left and right ordinate values refer to left and right data sets, respectively, which were adjusted to match saturating amplitudes. (B) Normalized-averaged-normalized dim-flash photovoltage responses in control (n = 13) and regenerated SPs (n = 9), highlighting the difference in integration time. These records were obtained as follows: (i) the average dim-flash response of each SP was normalized to its peak amplitude (always below 2 mV), (ii) normalized responses were averaged across cells, (iii) the final average was normalized to its peak. Shaded areas show ±1 SEM. (C) Photovoltage response amplitudes to 520-nm flashes before (gray circles) and after visual pigment regeneration with 9-cis-Retinal (red circles with a dot) of a LP. Responses to 590-nm flashes are also shown (small empty circles; error bars are smaller than circle diameter). Error bars are SEM. Although secondary to the main goal of this analysis, we also tested the effect of 9-cis-Retinal on LPs. In one LP, the sensitivity at 520 nm increased by 22-fold after superfusion with 9-cis-Retinal (Figure 3C; second, lower sensitivity component). Moreover, sensitivity was much higher (p < 0.05) in regenerated than in control LPs: half-maximal response at 520 nm evoked with flashes (i1/2) of 2385 ± 513 photons·µm−2 (n = 7; regenerated) vs 1.9 × 105 ± 1.1 × 105 photons·µm−2 (n = 7; control; second, lower sensitivity component; see ‘Materials and methods’ for details on the uncertainty of this specific value). As expected for the incorporation of 9-cis-Retinal in a significant fraction of the LP visual pigment pool (Makino et al., 1999), this increase in sensitivity was associated with a marked hypsochromic shift. Specifically, the ratio of sensitivities at 520 and 590 nm went from 1.1 to 1.7 in the single LP treated with 9-cis-Retinal (Figure 3C, compare large and small circles) and was significantly higher (p < 0.01) in regenerated than in control LPs: 1.8 ± 0.1 (n = 7; regenerated) vs 1.1 ± 0.04 (n = 6; control). To examine the properties of lamprey photoreceptors under fully dark-adapted conditions, all subsequent experiments were made on retinas pretreated with 9-cis-Retinal. After pigment regeneration, the photovoltage responses of SPs, recorded with patch clamp, remained markedly slower than those of LPs (Figure 4A,B). To characterize the photoreceptors' kinetics, for each recorded cell we plotted time-to-peak (TTP) and decay time constant (τrec) as a function of flash strength normalized to its half-maximal value (i1/2) (Figure 4C,D). From linear fits to the data, we estimated the values of these parameters at i1/2: for SPs, the TTP was 0.29 ± 0.04 s (n = 11) and the τrec was 1.05 ± 0.27 s (n = 11). In contrast, for LPs, the TTP was only 0.11 ± 0.007 s (n = 10; p < 0.001) and the τrec only 0.12 ± 0.02 (n = 10; p < 0.001). Therefore, when compared at flash strengths eliciting responses of similar fractional amplitude, SPs were indeed slower than LPs. Importantly, while the estimates of TTP and τrec in LPs may have been influenced to some degree by the signals that are fed to them from SPs (see above), the latter would have acted to reduce (rather than increase) the differences in kinetics between the two photoreceptors. SPs are markedly slower than LPs. (A and B) Average responses to 520-nm flashes of a SP (0.5, 1.6, 5.4, 15, 45, 136, 398, 1128 photons·µm−2) and a LP (16, 51, 170, 469, 1413, 4314, 12,597, 38,847, 77,695 ph·µm−2), both recorded with patch clamp after visual pigment regeneration with 9-cis-Retinal. (C and D) Plots of time-to-peak (TTP) and decay time constant (τrec) vs flash strength, normalized to its half-maximal value i1/2, in regenerated SPs (n = 11; empty circles) and LPs (n = 10; full circles). The data from each cell are connected by lines. To compare the intrinsic light sensitivity of regenerated SPs and LPs, we first considered whether we should correct their half-maximal flash strengths (i1/2) measured at 520 nm for: (i) the position of the peaks of their action spectra (λmax) with respect to the stimulus wavelength and (ii) the smaller quantum efficiency of pigment bound to 9-cis-Retinal (about one third; Hubbard and Kropf, 1958; Hurley et al., 1977). Both factors have the effect of reducing the sensitivity displayed by the photoreceptor with respect to its maximum achievable level. For SPs, we made the conservative assumption that they incorporated only a negligible amount of 9-cis-Retinal, as suggested by their limited increase in sensitivity following regeneration combined with their expression of bleaching desensitization (and supported by the non-significant change in their 520/590 nm sensitivity ratios). This implied that our 520-nm flashes essentially coincided with λmax (517 nm, see above) and that no correction was necessary for their i1/2 of 63 ± 11 photons·µm−2 (n = 12). Given the conservative nature of the above assumption, this value provides a lower bound for the maximal sensitivity of fully dark-adapted SPs. For LPs, we made the equally conservative assumption that their entire visual pigment pool was replaced with 9-cis-Retinal. We then predicted their modified action spectrum (Figure 1—figure supplement 1B) by slightly adjusting two parameters of the 9A1 template for red cones of Makino et al. (1999) (λmax_A0 from 508 to 507 nm and λmax_G1 from 567 to 566 nm; see their Table 2) so as to match our experimentally determined ratio of sensitivities at 520 and 590 nm of 1.8 ± 0.1 (n = 7; see above). Taking into account the off-peak position of our flashes (520 nm) relative to the λmax of this action spectrum (541 nm) and the smaller quantum efficiency of regenerated pigment, the corrected i1/2 of LPs was 777 ± 167 photons·µm−2 (n = 7). Given the conservative initial assumption, this value provides an upper bound for the maximal sensitivity of fully dark-adapted LPs. The i1/2 of LPs was much higher than that of SPs (p < 0.001). Note that signals feeding from SPs into LPs would have acted to reduce (rather than increase) the differences in sensitivity between the two photoreceptors, leaving our conclusions unchanged. A crucial functional measure of the position of lamprey SPs with respect to the evolutionary transition from an ancestral cone to the modern rod is their performance in amplifying single photons (Lamb, 2013). Regenerated SPs were highly sensitive, with absolute and fractional dim-flash sensitivities in patch clamp of 0.61 ± 0.17 mV·photons−1·µm2 (n = 8) and 3.0 ± 0.6%·photons−1·µm2 (n = 8). We obtained a first estimate of their fractional single photon response of 2.6 ± 0.5%·R* −1 (n = 8) by dividing the fractional dim-flash sensitivity with a theoretical effective collecting area of 1.18 µm2·R*·photons−1 (see ‘Materials and methods’). A search for quantal responses using the patch-clamp technique proved inconclusive, as also observed in similar recordings of photoreceptors from those jawed vertebrates having extensively coupled rods (Fain, 1975). We thus performed suction electrode photocurrent recordings from the conical outer segments of SPs, in retinae pretreated with 9-cis-Retinal (100 µM for 20–25 min): this recording technique only measures the current flowing through the membrane enclosed in the pipette and is thus ideally suited to examine phototransduction in a given photoreceptor without an appreciable contribution of its electrically coupled neighbors (Baylor et al., 1979a). Under these conditions, responses to repeated delivery of dim flashes were highly variable in amplitude (Figure 5A). We estimated the absolute amplitude of the single photon response (a) to be 0.41 ± 0.04 pA (n = 10), by dividing the increase in the time-dependent variance by the mean response for each SP (Figure 5B) (Rieke and Baylor, 1998) (for details on the use of variance analysis in single photon response estimation see the ‘Materials and methods’). The normalized time-dependent squared mean responses and variance increases overlapped (Figure 5B) (Rieke and Baylor, 1998), consistent with the single photon responses being governed by Poisson statistics. The fractional amplitude of the single photon response (a%), determined for each SP on the basis of its maximal response to a single saturating flash delivered prior to the dim flash trains, was 2.6 ± 0.3%·R* −1 (n = 10), in line with the independent estimate obtained with patch (see above). Lastly, the signal-to-noise ratio (SNR), determined for each SP as the ratio of a over the standard deviation of the biological component of dark noise measured between consecutive dim flashes (0.5–20 Hz), was 1.5 ± 0.1 (n = 10). Importantly, the values of a, a%, and SNR in SPs are within the range reported for jawed vertebrate rods (Figure 6). In these experiments, we: (i) recorded only from intact outer segments (Figure 1C, inset), (ii) observed similar dark currents (maximum current change with a saturating flash) with patch clamp (13 ± 3 pA, n = 4) and suction electrodes (16 ± 1 pA, n = 10), and (iii) measured similar collecting areas (0.83 ± 0.17 µm2·R*·photons−1, n = 10; ratio of the squared mean response over the product of the variance increase and the flash strength [Rieke and Baylor, 1998]) to theoretical prediction (1.18 µm2·R*·photons−1). From this, it is highly likely that we had complete suction of the outer segment, and as such, we could make reliable estimates of a% and SNR. Suction electrode recordings of SP photocurrents in the single photon regime. (A) Samples of dim-flash response trains recorded from the outer segments of 4 SPs (SP1: flash strength = 1.64 photons·µm−2, a = 0.25 pA; SP2: 3.26 ph·µm−2, 0.43 pA; SP3: 1.64 ph·µm−2, 0.56 pA; SP4: 3.26 ph µm−2, 0.56·pA). (B) Single photon response analysis from one SP (SP3 in panel A), showing the mean response μ (thin trace: gross mean response, dotted trace: mean dark current, thick trace: net mean response), time-dependent variance σ2 (thin trace: gross variance, dotted trace: dark current variance, thick trace: net variance), normalized squared mean response norm μ2 (thin trace) and variance norm σ2 (thick trace). Dashed lines indicate the current baseline or zero level. Dark current records were taken from the last 2 s preceding each flash and where baselined in the first 1.1 s, therefore, dark and net current records cover up to 0.9 s after the flash (see ‘Materials and methods’). Lamprey SP single photon response parameters in the context of those of jawed vertebrate rods. River lamprey: this study; Jawed vertebrates: previous studies. (A) Absolute amplitude of the single photon response (a). (B) Fractional amplitude of the single photon response (a%). (C) Signal-to-noise ratio (SNR). Data points shown in the figure were obtained with suction pipette recordings of photoreceptor outer segments. Error bars for lamprey are SEM. Letters next to the data points correspond to the following references: a (Palacios et al., 1998), b (Ala-Laurila et al., 2007), c (Baylor et al., 1984), d (Baylor et al., 1979a, 1979b), e (Baylor et al., 1980), f (Nakatani et al., 1991), g (Robinson et al., 1993), h (Field and Rieke, 2002b), i (Field and Rieke, 2002a), j (Okawa et al., 2010), k (Mendez et al., 2001), l (Burns et al., 2002), m (Azevedo and Rieke, 2011), n (Krispel et al., 2006), o (Luo and Yau, 2005), p (Makino et al., 2004), q (Wen et al., 2009), r (Gross and Burns, 2010), s (Palma et al., 2001), t (Donner et al., 1990), u (Vogalis et al., 2011), v (Nikonov et al., 2006), w (Rieke and Baylor, 2000). The single photon response analysis made with suction pipettes allowed us to estimate an amplification constant of phototransduction (Pugh and Lamb, 1993) in lamprey SPs of 0.59 ± 0.09 s−2 at 9–11°C (n = 10), which lies between that of the large amphibian rods at room temperature (∼0.1 s−2) and that of small mammalian rods at body temperature (∼8 s−2) (Lamb and Pugh, 2006). The integration time measured with suction electrodes was 1.45 ± 0.10 s (n = 10), somewhat higher than that obtained with patch clamp (which also incorporates downstream processing in the inner segment). Taken together, the high-amplification constant and relatively long integration time are key contributors to SPs' single photon performance. We examined lamprey SPs and LPs and found that their general properties closely match those of jawed vertebrate rods and cones: dark membrane potentials of around −45 mV, hyperpolarizing responses of up to 30 mV upon illumination, and the expression of a prominent hyperpolarization-activated Ih current are all typical traits of jawed vertebrate photoreceptors and must therefore have been in place already by the middle Cambrian. A similar conclusion can be made for bleaching adaptation, which we confirmed to be present in SPs. In jawed vertebrates, this phenomenon is the result of a very low-constitutive activity of free opsin and occurs in both rods and cones exposed to bleaching lights (Cornwall and Fain, 1994; Cornwall et al., 1995; Fain et al., 2001; Lamb and Pugh, 2004). To assess whether SPs, the phylogenetic homologues of rods (Pisani et al., 2006; Muradov et al., 2008; Lamb, 2013), also operate like rods, we focused on multiple properties both at the level of single photon detection in the outer segment and of downstream signal processing in the inner segment. The rationale behind this approach is that, even if individual functional parameters of SPs and rods could have evolved independently towards a common present state (convergent evolution), this becomes quite unlikely if multiple common features are observed. We find that SPs are exquisitely sensitive to light and feed their signals to the less sensitive but intrinsically faster LPs, similarly to the way rods feed their signals to cones via gap junctions in jawed vertebrates (Asteriti et al., 2014). The likely anatomical substrate of this signal crossover is represented by the thin telodendrial processes that we observed to extend laterally from the synaptic pole of the photoreceptors. Telodendria are ubiquitous in jawed vertebrates and their only known function is to form gap junctional contacts with nearby photoreceptors (O'Brien et al., 2012). While in mammals these processes are known to extend only from cone pedicles, in cold-blooded vertebrates they are also formed by rods (Fadool, 2003). Since rod-cone coupling is thought to provide a secondary route for rod signals when the high-gain output synapse of rods is saturated (Attwell et al., 1987), the question arises of whether lamprey SPs have properties of synaptic transmission similar to those of rods and a dedicated postsynaptic circuitry for scotopic signaling. Furthermore, in mammalian photoreceptors, the Ih current has been proposed to assist rod-cone signaling via gap junctions (Seeliger et al., 2011), a role it could also play in the lamprey retina given the presence of telodendria and SP–LP signal flow. The functional similarities between lamprey SPs and jawed vertebrate rods discussed above, extend to the efficient processing in the single photon regime. With regards to scotopic performance, we found that dark-adapted SPs approach the efficiency of jawed vertebrate rods, both in terms of absolute and fractional single photon response and of its SNR. Here, it is important to note that while the fractional single photon response a% and the SNR are potentially subject to overestimation due to the fact that their denominators (the circulating current in darkness for a% and the biological dark noise for the SNR) appear smaller if the outer segment is damaged or is not fully within the recording pipette (see however the evidence above that these conditions were respected in our experiments), this issue does not exist when estimating the absolute amplitude a. Taken together, our findings raise the strong possibility that our last common ancestor in the middle Cambrian had already evolved scotopic vision. Recent evidence indicates that the lamprey line diverged soon after (Smith et al., 2013) the occurrence of two rounds of whole-genome duplication in stem vertebrates (2R) (Dehal and Boore, 2005; Putnam et al., 2008), which led to the diversification of the ancestral visual opsin and phototransduction protein repertoire (Lagman et al., 2013). Therefore, dim-light vision appears to have been acquired rapidly once a dedicated set of genes became available for specializing a type of cone into the rod (Okano et al., 1992; Yokoyama, 2000; Lamb et al., 2007; Kawamura and Tachibanaki, 2008; Shichida and Matsuyama, 2009). Admittedly, one cannot definitively exclude that such performance was refined independently in the two branches following their split ∼505 Ma (Erwin et al., 2011): to do so, one would need to resurrect (Thornton, 2004) the full ancestral phototransductive cascade and then characterize its function. However, our data provide compelling support for the view that the evolution of the modern rod was already well under way at the time of divergence of the two branches: (i) the similarities between SPs and rods are multiple and extend from phototransduction to downstream processing, (ii) the photoreceptors specialized for scotopic vision in lampreys and in jawed vertebrates derive from one and the same precursor (and not from different ancestral cones), (iii) some of the phototransduction protein isoforms examined thus far in SPs clade with those of rods. This newly evolved ability to operate in dim light would have provided a significant advantage to early vertebrates faced with intense competition in a rapidly evolving ecological landscape (Paterson et al., 2011; Lacalli, 2012). In coincidence with the submission of the present work, a study on the photoreceptors of a different species of lamprey was published (Morshedian and Fain, 2015), based on suction electrode recordings from outer segments. Although our study examines a broader range of photoreceptor properties, with both patch-clamp and suction electrode recordings, the two studies converge on the positive response to single photons. L. fluviatilis of both sexes were collected during their spawning run either: (i) in the Swedish river Dal while migrating upstream from the gulf of Bothnia, at the end of summer 2013 or (ii) in the French river Garonne while migrating upstream from the Atlantic ocean, at the end of winter 2015. The animals were housed in a tank containing artificial water mimicking either: (i) that of the drainage lakes in the Dalarna region (Arnemo, 1964): (in µM) 60 CaSO4, 110 NaHCO3, 60 MgCl2, 20 KCl, 290 CaCO3 or (ii) that of the Garonne (Etchanchu and Probst, 1988): (in µM) 223 CaSO4, 431 NaHCO3, 200 MgCl2, 42 KCl, 907 CaCO3. Both water types were supplemented with 5% bottled mineral water for trace elements. Tank water temperature was kept at 5–6°C (i.e., below the spawning threshold of this species [Hardisty and Potter, 1971]) and steady state pH was 7.2. A 10-hr light/14-hr dark cycle was adopted, except in preparation for the electrophysiological experiment when the animals were dark-adapted for at least 24 hr. Lampreys were deeply anesthetized with 400 mg/l tricaine methanesulfonate (MS-222; E10521, Sigma–Aldrich, St. Louis, MO) and decapitated. All subsequent procedures were performed under dim far-red light in ice-cold bicarbonate buffered Ames' medium (A1420, Sigma–Aldrich), equilibrated with O2/CO2. Main constituents of Ames' are (in mM) 120 NaCl, 22.6 NaHCO3, 6 D-glucose, 3.1 KCl, 1.2 MgSO4, 1.1 CaCl2, 0.5 KH2PO4, 0.5 L-glutamine. The head was pinned down in a sylgard-lined dissection chamber, the primary eye spectacles and the corneas were removed by performing circular cuts with fine scissors and the eyes enucleated with the lenses still in situ. One eyecup was transferred to the slicing chamber where the lens was removed and the retina gently detached from the sclera and extracted, while the other was stored in the fridge in bicarbonate buffered Ames' under an O2/CO2 atmosphere and used the following day. Slices of 250-µm thickness were obtained as previously described for the mouse retina (Cangiano et al., 2012), transferred to a recording chamber, superfused with bicarbonate buffered Ames' medium at 9–11°C, and visualized with DIC microscopy at 780 nm. For suction electrode recordings only, 0.25 mg ml−1 hyaluronidase type IV (H3884; Sigma–Aldrich) was added to the slicing solution to clear the extracellular matrix surrounding the outer segments and facilitate pipette access. The inner segments of SPs and LPs lying close to the slice surface (Figure 1A) were visually targeted with 5–6 MOhm pipettes pulled with a P-97 (Sutter Instruments, Novato, CA) from borosilicate glass capillaries (1B120F-4, WPI, Sarasota, FL) and filled with a solution containing (in mM) 90 Kaspartate, 20 K2SO4, 15 KCl, 10 NaCl, 5 K2Pipes, as well as 0.5 mg ml−1 Lucifer yellow, and corrected to a pH of 7.20 with KOH/HCl. The backfilling solution also contained 0.4 mg ml−1 Amphotericin B (item no. 11636, Cayman, Ann Arbor, MI) pre-dissolved in dimethyl sulfoxide (DMSO) at 60 mg ml−1. Based on an analysis of the liquid junction and Donnan potentials when using this solution and recording photoreceptors (Cangiano et al., 2012), we report uncorrected values of membrane potential. Recordings were made with an Axopatch 1D amplifier, low-pass filtered at 500 Hz and acquired at 5 KHz with a Digidata 1320 and pClamp 9 software (Molecular Devices, Sunnyvale, CA). The outer segment current of intact SPs lying close to the slice surface (Figure 1C, inset) was recorded with suction electrodes (Baylor et al., 1979a). Specifically, glass capillaries (intraMARK, Blaubrand, Germany) were pulled with a P-97, broken to obtain even tips of 10–20 µm and heat polished to ∼4-µm inner diameter. Tips were silanized by dipping in Sigmacote solution (SL2, Sigma–Aldrich), followed by vigorous back suction in air. Finally, pipettes were rinsed and filled with filtered Ames' medium, for a resistance in the bath of 2–3 MOhm. Intrapipette pressure was controlled with a pneumatic system filled with light mineral oil (330779; Sigma–Aldrich) using coarse and fine precision syringes (100 µL and 10 µL; Hamilton, Reno, NV) actuated by micrometer heads. Recordings were made in voltage clamp (holding voltage set at zero) with the same apparatus described above, except that signals were low-pass filtered at 20 Hz before acquisition (4-pole Bessel filter). Full-field stimuli of unpolarized light were delivered by a green LED (520 nm; OD520; Optodiode Corp., Newbury Park, CA) or a yellow-orange LED (590 nm; APG2C3-590; Roithner LaserTechnik, Austria) mounted beside the objective turret. LEDs were driven by current sources commanded through the analog outputs of a Digidata 1320A (Axon Instruments, Foster City, CA). The power density reaching the recording chamber vs LED drive was measured separately with a calibrated low-power detector (1815-C/818-UV; Newport, Irvine, CA) positioned at the recording chamber. Flash duration was in the range 1–27 ms. Consecutive bright flashes were delivered at intervals of 13 s between each other. The photon flux density reaching the photoreceptors was derived from the measured power density and was likely to be overestimated to varying degrees across recorded cells due to reflection at the air–water interface and absorption by the surrounding tissue. In patch-clamp recordings, outer segments were generally, but not strictly, oriented at right angles with respect to the direction of incident light. In suction electrode recordings, orthogonality was instead guaranteed by the pipette itself. Where specified, any bleached visual pigment was regenerated with the artificial chromophore analog 9-cis-Retinal. Stock solutions of 9-cis-Retinal (R5754; Sigma–Aldrich) in ethanol (100 mM) were prepared in darkness and stored at −80°C. On the day of the experiment, an aliquot was thawed and diluted to a final concentration of 100 µM in Ames' medium integrated with 1% wt/vol fatty acid-free bovine serum albumin (A8806; Sigma–Aldrich), an effective solubilizing and protective agent (Li et al., 1999). This solution was delivered to the preparation directly in the recording chamber, without modifying flow rate or temperature, for 20–25 min followed by washout. A pharmacological blockade of gap junctions was attempted with meclofenamic acid (MFA; M4531, Sigma–Aldrich) and 2-aminoethyl diphenylborinate (2-APB; D9754, Sigma–Aldrich). The Ih current was blocked with 4-Ethylphenylamino-1,2-dimethyl-6-methylaminopyrimidinium chloride (ZD7288; cat. no. 1000, Tocris, United Kingdom). where V is the volume of their truncated conical outer segments, estimated at 102 µm3 from mean values of length (13.0 µm), basal diameter (4.5 µm), and apical diameter (1.6 µm) measured in optical images acquired from live slices; f is a factor accounting for the dichroism of native opsin (1 for light incident along the outer segment axis and 0.5 for unpolarized light incident at right angles); α is the specific axial pigment density at the maximum absorption wavelength, measured (Govardovskii and Lychakov, 1984) in lamprey SPs at 0.015 µm−1, a value similar to that of lower vertebrate rods containing rhodopsin and/or porphyropsin (Harosi, 1975); Qisom is the quantum efficiency of photoisomerization, assumed to have the rhodopsin value of 0.67 R*·photons−1. Note that any bleached visual pigment regenerated with 9-cis-Retinal would have the somewhat different absorption spectrum and quantum efficiency of isorhodopsin (Hubbard and Kropf, 1958; Hurley et al., 1977; Makino et al., 1999); however, this contribution was neglected since the twofold–threefold increase in sensitivity displayed by SPs after delivery of 9-cis-Retinal could result from the regeneration of a small fraction of bleached pigment due to the phenomenon of bleaching desensitization (e.g., in larval tiger salamander rods, bleaching of ∼6% rhodopsin halves sensitivity [Jones et al., 1996]). Data in the text and graphs are reported as mean and standard error of the mean. Statistical significance was assessed with the Mann–Whitney–Wilcoxon test. Integration time was defined as the integral of the dim-flash response divided by its peak amplitude. TTP was measured starting from the middle of the flash. Decay time constant (τrec) was estimated by fitting a single exponential to the second half of the flash response recovery phase (i.e., starting from the point when the response had recovered to about half of its peak amplitude). Half-maximal response flash strength (i1/2) and light sensitivity (defined as its reciprocal) were obtained by fitting exponential saturation functions to response amplitude vs flash strength graphs. In the fitting procedure, the brightest saturating flashes delivered to SPs were excluded since they showed diminishing response amplitudes due to incomplete recovery from the previous flash in the 13-s interval used in our protocols. Since the low-sensitivity response component of LPs untreated with 9-cis-Retinal did not reach saturation with the flash strengths used in this study, fits were performed (i) by using the saturating amplitude observed after delivery of 9-cis-Retinal (when this was available) or (ii) by assuming a conservative saturating amplitude of 16 mV (i.e., the smallest value observed in LPs). The second assumption implies that we likely underestimated the half-maximal flash strength of unregenerated LPs (low-sensitivity component). Precise estimates of SP dim-flash sensitivity were obtained by dividing the amplitude of the mean response to many dim flashes by the strength of these flashes. The single photon response amplitude a was estimated by the established method of variance analysis (Baylor et al., 1979b, 1984; Rieke and Baylor, 1998; Vogalis et al., 2011). Specifically, for each SP, the net mean response and time-dependent variance were calculated, from an ensemble of at least 50-dim flashes, as follows: (i) the gross mean response and variance were calculated after aligning the raw flash response records by subtracting their average value in the 1.1-s interval before the flash; (ii) the mean and variance in darkness were calculated from the 2-s interval prior to each flash, again after aligning the raw dark records by subtracting their average value in the first 1.1 s; (iii) the net mean response and variance were obtained by subtracting those in darkness from the gross ones, and therefore, include only the first 0.9 s after the flash: this, however, was sufficient to encompass the peak of the dim-flash response (Figure 5B). In those SPs in which dim flashes of two strengths were delivered, the final estimate of a was the average of the two separate estimates, weighed by their respective number of flashes. As in other rod studies in which a was small relative to total recorded dark noise, we could not perform a reliable analysis of the single photon response with amplitude histograms (notably, only 6 of the 26 estimates of a plotted in Figure 6A included histogram analysis). However, when both the variance and histogram techniques were employed, similar values of a were found (Baylor et al., 1979b, 1984; Vogalis et al., 2011). Biological dark noise was taken as the square root of the difference between the recorded dark noise variance (integral within 0.5–20 Hz of the average power spectrum in the 2.1 s before the dim flashes) and the expected thermal noise variance (Baylor et al., 1979b, 1984) (using the measured pipette seal resistance). The amplification constant of phototransduction was estimated by fitting the rising phase of the average dim-flash response with Equation 23 in Pugh and Lamb (1993). For these fits, a delay teff of 23 ms was used, which was separately estimated by fitting Equation 20 in Pugh and Lamb (1993) to full families of flash responses. The average number of photoisomerizations/flash was a result of the single photon response analysis. Exclusively for presentation purposes, the electrophysiological records shown in the figures were conditioned as follows: (i) current-clamp patch recordings were ‘box car’ filtered with a running window of 20 ms, (ii) voltage-clamp suction pipette recordings were detrended (Vogalis et al., 2011) to remove slow fluctuations in the baseline current and digitally low-pass filtered at 2 Hz. The Journal of Physiology 585:57–74. The Journal of Neuroscience 31:3670–3682. The Journal of Physiology 288:613–634. The Journal of Physiology 590:3841–3855. Proceedings of the National Academy of Sciences of USA 111:15486–15490. Philosophical Transactions of the Royal Society of London Series B, Biological Sciences 364:2925–2940. The Journal of Physiology 480:261–279. The Journal of General Physiology 106:543–557. The Journal of Physiology 428:673–692. Journal of Comparative Physiology A 154:279–286. The Journal of Neuroscience 30:3450–3457. The Journal of General Physiology 66:357–382. Proceedings of the National Academy of Sciences of USA 107:19379–19383. Proceedings of the National Academy of Sciences of USA 44:130–139. The Journal of General Physiology 108:333–340. The Journal of Comparative Neurology 517:257–275. Comparative Biochemistry and Physiology Part A 150:369–377. Timing of genome duplications relative to the origin of the vertebrates: did cyclostomes diverge before or after? Molecular Biology and Evolution 26:47–59. Progress in Retinal and Eye Research 36:52–119. Progress in Retinal and Eye Research 23:307–380. Investigative Ophthalmology & Visual Science 47:5137–5152. The Journal of General Physiology 126:263–269. Proceedings of the National Academy of Sciences of USA 98:9948–9953. The Journal of General Physiology 97:413–435. The Journal of Neuroscience 32:4675–4687. Proceedings of the National Academy of Sciences of USA 89:5932–5936. The Journal of Physiology 588:1947–1960. Biochimica et Biophysica Acta 1141:111–149. The Journal of Physiology 462:465–481. Philosophical Transactions of the Royal Society B 364:2881–2895. 415–421, Nature Genetics, 45, 421e1–421e2, 10.1038/ng.2568. The Journal of Physiology 589:2321–2348. The Journal of General Physiology 25:331–336. The British Journal of Ophthalmology 19:129–148. Thank you for choosing to send your work entitled “A Cambrian Origin for Vertebrate Rods” for consideration at eLife. Your full submission has been evaluated by a Senior editor, a Reviewing editor, and three peer reviewers, and the decision was reached after discussions between the reviewers. Based on our discussions and the individual reviews below, we regret to inform you that your work will not be considered further for publication in eLife. Three experts carefully reviewed the manuscript. While the reviewers found the work interesting, the number of substantive questions raised was such that we feel we must reject it. We hope that the reviewers’ comments below will be useful to you in revising the manuscript. The manuscript by Asteriti and colleagues describes experiments seeking to characterize the functional properties of lamprey SP and LP photoreceptors in an effort to determine the time of the evolutionary emergence of rods. They perform patch clamp and suction electrode recordings from SP and LP photoreceptors and show that these cells differ in their sensitivity and response kinetics, similarly to modern rods and cones. Notably, SP photoreceptors display fractional sensitivity and single photon response amplitude comparable to these of jawed vertebrate rods. The authors conclude that the origin of rods precedes the divergence of the lamprey line during the Cambrian. This is an interesting result addressing a fundamental question in photoreceptor biology. Although a similar study was recently published by Morshedian and Fain in Current Biology (Curr Biol 25, 484-487, Feb 2015), this current study appears to be independent and also provides several original points. These include the coupling of SP and LP photoreceptors, which is similar to the one found in jawed vertebrates, and the functional effects of the seasonal lamprey vitamin A deprivation of SP and LP flash responses. The authors mention that the averaged sensitivity is higher in 9-cis regenerated SPs compared to controls and even give a p-value and “n” but do not provide the actual sensitivity values. The same issue applies to the integration time. For LPs, the corresponding statement is restricted to one cell. Such glaring omission raises doubts about the quality of the data. The authors should address this by providing values for all measured parameters in SP and LP cells, ideally in a table format. 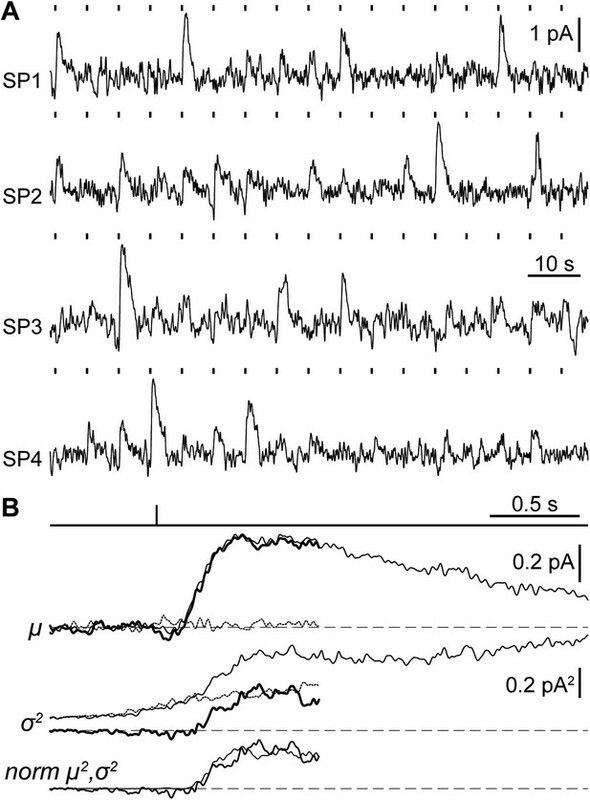 There is no mention whether the authors took into account the slow (presumably SP-driven) component of the flash response, as shown in Figure 2B, when analyzing the LPs response sensitivity and kinetics. The mean response and variance traces in Figure 5B are truncated shortly after the peak. Why? “Duration” of the response is not typically used in photoreceptor response analysis. More rigorous ways of analyzing the kinetics of flash responses exist. In addition to integration time, mentioned by the authors, these include time to peak and recovery time (exponential fit to the tail of the response shutoff). Amplification constant is mentioned in the Methods but not mentioned in the Results. What were the values for SPs and LPs and how did they compare to these of jawed vertebrate cells? In the Discussion, bleaching adaptation is mentioned as one of the similarities between lamprey SPs and jawed rods. This is not a rod-specific phenomenon as cones (and apparently LPs) experience similar bleaching adaptation (e.g. Cornwall et al., GL. J. Gen Physiol. 1995. 106:543-57). In addition, the statement that bleached opsin is key determinant of the very slow time course of dark adaptation is misleading. Dark adaptation is regulated by the regeneration of visual pigment and the supply of chromophore (e.g. Lamb TD, Pugh EN Jr. Prog Retin Eye Res. 2004 23:307-80), which occur significantly slower for rods than for cones. This paper describes experiments on the light-response properties of retinal photoreceptors in the lamprey. The results and conclusions are similar to those published most recently by Morshedian and Fain in Current Biology (2015). Both groups studied the northern-hemisphere lamprey, albeit different species. Considering the close proximity in time between the two, the respective experiments probably proceeded pretty much in parallel. The experiments are mostly fairly straightforward and standard, describing membrane parameters, membrane potential and such, as well as the light-response properties. 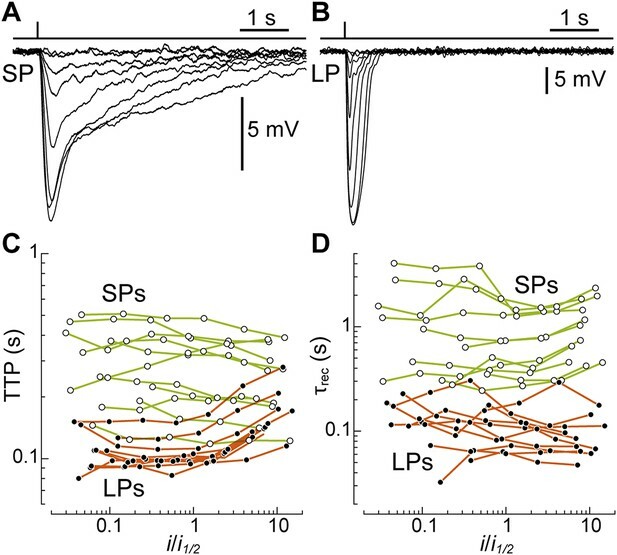 The synaptic interactions between rod-like (SP) and cone-like (LP) photoreceptors (input from SP to LP cells) described here were apparently not observed by Morshedian and Fain. The reason for this is not entirely clear, but possibly due to different thicknesses of the retinal slices used by the two groups (thickness not specified by Morshedian and Fain) that might have disrupted such interactions in one but not the other preparation. The section on bleaching adaptation is cryptic and not clear. For SP cells, it was described that the sensitivity was higher after regeneration by exogenous chromophore than in control. Considering that the retina was dark-adapted for 24 hours, and that rhodopsin (unlike cone pigment) does not show the property of re-dissociation (thus no chromophore exchange) in darkness, the increase in sensitivity after regeneration must reflect the presence of naked opsin already in darkness due to vitamin-A deficiency as the authors quoted, but they should at least make some clarifying comments and possibly even conduct more experiments to investigate further. Otherwise, the authors would come across as trivializing the phenomenon of bleaching adaptation (whereas it is in fact far from trivial). For LP cells, having done just one experiment is also unacceptable. In any case, what is the bottom line of this section in relation to the overall paper? This reviewer thinks that it should either be deleted completely or more experiments are necessary. In the single-photon-response section, no response-amplitude histogram is shown, despite the many flash trails performed. This should be properly shown and compared with the estimate based on the variance/mean ratio. Overall, some of the experiments appear to be hastily performed/analyzed and the paper superficially written, perhaps under pressure due to competition from the other group. Nonetheless, even if so, this is not acceptable for eLife, a journal that this reviewer understands to be of very high quality. They have shown that 1) the short (SP) and long (LP) photoreceptors exhibit dark membrane potentials and inner segment properties of jawed vertebrate rods and cones, respectively, 2) visual pigments in SPs are maximally sensitive to 520 nm and those in LPs are sensitive to 590 nm, which were suspected to represent RH1 and LWS pigments, respectively, 3) 9-cis-retinal delivery to vitamin A1-starved SPs increased the efficiency in the sensitivity and time of presumed RH1 pigment response, 4) LPs respond to light at 520 nm much faster than SPs and 5) single photon responses of SPs correspond to those of jawed vertebrate rods. These results show that the lamprey uses photoreceptors with the characteristics of jawed vertebrate rods and cones and imply that “our last common ancestor in the middle Cambrian had already evolved scotopic vision” (Discussion, last paragraph). These results improve our understanding of lamprey vision and the display of the cone-like morphologies of the SPs and LPs is effective (Figure 2). However, when the authors relate their results to photoreceptor evolution, the clarity of the presentation decreases. The problem is that rods and cones cannot be defined as clearly as the authors indicate. Ancestral photoreceptor cell types may be guessed from those of present-day lampreys, hagfishes, sea-squirts and lancelets, but we really don't know what they actually looked like. Photoreceptor cells in these modern organisms are the evolutionary products of the geological time scale and can differ significantly from those of their ancestors. The oft-discussed Anolis carolinensis with supposedly pure-cone retinas and Gekko gecko with presumably pure-rod retinas express “typical” rod- and cone-specific pigments, respectively. We can easily imagine photoreceptors with the mixture of rod- and cone-characteristics. First, the extensive opsin sequence data show that visual pigments in vertebrates, including the lamprey, are classified into five evolutionarily distantly related RH1, RH2, SWS1, SWS2 and M/LWS pigment groups (e.g. Figure 22 in Lamb, 2013). Such phylogenetic trees also show that all five groups of visual pigments already existed well before the lamprey ancestor appeared and, therefore, the lamprey may not be claimed to be the critical species to study photoreceptor evolution. Second, by actually engineering the visual pigments at several stages of vertebrate evolution, it has been found that RH1 pigments (Yokoyama et al. PNAS 105, 13480-13485, 2008), SWS1 pigments (Shi & Yokoyama PNAS 100, 8308-8313, 2003) and M/LWS pigments (Yokoyama & Radlwimmer Genetics 158, 1697-1710, 2001) of most early vertebrate ancestors detected light maximally at 500 nm, 360 nm and 560 nm, respectively. These well-differentiated absorption spectra of visual pigments in the vertebrate ancestor further suggest that basic chemical machineries involved in the phototransduction also differentiated before the lamprey appeared. Hence, the coexistence of rods and cones in the vertebrate ancestor, as implicated by the authors, is consistent with the functional evolutionary analyses of visual pigments. However, the reconstruction of ancestral visual pigments reveals nothing about photoreceptor cell types and the analyses of the SPs and LPs of the present-day northern hemisphere lamprey are meaningful. Third, the five major visual pigment groups in vertebrates have arisen from a single type of pigment, followed by three rounds of gene duplication. At present, several visual pigments of sea-squirt and lancelet have been characterized, among which only one pigment in sea-squirt clusters with the vertebrate visual pigments (e.g. Kusakabe et al. FEBS Lett. 506, 69-72, 2001). Hence, if we are interested in the evolution of rods and cones, the critical time period may be somewhere after the appearance of lancelet but before the appearance of the lamprey, which is much earlier than the authors indicate. Then, the critical question seems to be what the photoreceptor that expressed this specific ancestral visual pigment looked like in the first place. In summary, the physiological data of the SPs and LPs of the northern hemisphere lamprey obtained by the authors are valuable. However, when these results are interpreted as a part of photoreceptor evolution, the presentation becomes murky. For this reason, I cannot recommend that the paper be published as it stands. We sincerely appreciate the time and effort that was devoted to this evaluation, as well as the fast turnaround time. We present our objections to the concerns raised by reviewers 2 and 3 below. Reviewer 1, on the other hand, was supportive of the importance of our study and only found gaps in the analysis and presentation of the data, and a low number of some of the experiments. Here we also address his/her concerns, showing that the ‘missing’ analysis/data is either already present in the current manuscript or can be easily included. Lastly, following submission of our manuscript to eLife, we became aware that a study on the photoreceptors of another species of lamprey had just appeared in Current Biology (Feb 16 issue; Morshedian and Fain, 2015; “Single-photon sensitivity of lamprey rods with cone-like outer segments”). Our study goes well beyond what is shown by these authors in many important respects (as also acknowledged by reviewer 1). By examining multiple aspects of lamprey photoreceptor function we provide a much stronger case for an early origin of functionally modern rods: while one individual property could have emerged independently in the jawless and jawed vertebrate lines through convergent evolution, the more properties one finds to match the less likely this becomes. The authors mention that the averaged sensitivity is higher in 9-cis regenerated SPs compared to controls and even give a p-value and “n” but do not provide the actual sensitivity values. The same issue applies to the integration time. In the original manuscript (in the Results and Discussion sections) we did provide the values of both parameters for regenerated SPs: light sensitivity (“SPs had a half maximal response at 520 nm evoked with flashes of 43 ± 12 photons·μm–2 (n=6))” and integration time (“… a relatively long integration time of 1.45 ± 0.10 s (n=10))”. The values in control (vs. regenerated) SPs were omitted for brevity. We have now included the absolute values of light sensitivity and integration time for control SPs (in the second paragraph of the subsection headed “SPs display bleaching desensitization”). Moreover, as a byproduct of additional experiments we have increased the sample size in both the control and regenerated groups. This data is also reported in a new Table 1. For LPs, the corresponding statement is restricted to one cell. Such glaring omission raises doubts about the quality of the data. The authors should address this by providing values for all measured parameters in SP and LP cells, ideally in a table format. The single value mentioned by the reviewer is the increase in sensitivity observed in one LP upon delivery of 9-cis-retinal. Not reported in the original manuscript was data from separate groups of control (n=4) and regenerated LPs (n=6), providing statistical support (p<0.01) for an effect of 9-cis-retinal on this subset of photoreceptors. The reason for such omission was that our main focus in this section was to establish whether SPs (the rod-like photoreceptors) in migrating lampreys are partly bleached due to a vitamin A deficiency, as originally suggested by Wald (1942): obtaining this piece of information was essential to ensure that our subsequent single photon response analysis was performed in maximally sensitive (and not desensitized) SPs. Accordingly, the title of this section of the manuscript was “Bleaching adaptation (i.e. dark adaptation) in SPs”. This data is also reported in a new Table 1. As shown in a new Figure 4B, in regenerated LPs the slow component cannot be distinguished from the fast one. Therefore, the values of sensitivity and kinetics that we report for LPs necessarily include some SP-mediated input. This, however, does not affect our conclusion that LPs are intrinsically faster and less sensitive than SPs: any SP-mediated input would make LPs appear more SPs-like and thereby act to reduce the difference between the two photoreceptors. We have created two entirely new sections devoted to the analysis of the intrinsic differences in kinetics (“SPs are intrinsically slower than LPs”) and sensitivity (“SPs are intrinsically more sensitive than LPs”) between SPs and LPs. In both sections we explicitly mention the possible contribution of SP-LP signaling and present the argument outlined above. As mentioned in the original Methods section mean and variance of the raw dark records were obtained in the 2 s interval prior to each flash (aligned by subtracting their average value in the first 1.1 s). Since these were subtracted from the mean and variance of the flash responses, the final net records include only the first 0.9 s after the flash. As shown in Figure 5B this interval was sufficient to capture the peak of the dim flash response. We have revised the manuscript to clarify this point, both in the legend of Figure 5 and in the Materials and methods (end of the subsection entitled “Data analysis and reporting”). We agree with the reviewer that the duration of the flash response is seldom used in the literature, although it was rigorously defined in our manuscript. As recommended by the reviewer, we have replaced this parameter with time-to-peak (TTP) and time constant of recovery (τrec). The relevant data is now presented in a new dedicated section entitled “SPs are intrinsically slower than LPs”, as well as in a newly added Figure 4 (see figure file and legend). In the original manuscript, we did report the amplification constant of SPs in the Results section: “The high amplification constant of phototransduction (Pugh and Lamb, 1993) of 0.59 ± 0.09 s–2 at 9–11°C (n=10)…”. Providing an amplification constant for LPs is beyond the scope of our study, which is primarily concerned with characterizing the functional properties of SPs and comparing them to those of jawed vertebrate rods. Technically, it would be challenging to perform a fair comparison between SPs and LPs: while our estimate of the amplification constant in SPs is based on their measured collecting area (obtained from the variance analysis of the single photon response), an estimate in LPs would have to rely on a theoretically calculated collecting area. In the revised manuscript we compare the amplification constant of SPs to other vertebrates (subsection headed “The single photon response of SPs is within the range of jawed vertebrate rods”), showing that it falls between that of large amphibian rods at room temperature (∼0.1 s–2) and small mammalian rods at body temperature (∼8 s–2). This parameter is strongly dependent on temperature and outer segment volume, and, for any given rod, it acquires significance in the context of single photon processing when viewed together with integration time (Lamb and Pugh, 2006). Accordingly, we report amplification constant and integration time together. In the Discussion, bleaching adaptation is mentioned as one of the similarities between lamprey SPs and jawed rods. This is not a rod-specific phenomenon as cones (and apparently LPs) experience similar bleaching adaptation (e.g. Cornwall et al., GL. J. Gen Physiol. 1995. 106:543-57). In addition, the statement that bleached opsin is key determinant of the very slow time course of dark adaptation is misleading. Dark adaptation is regulated by the regeneration of visual pigment and the supply of chromophore (e.g. Lamb TD, Pugh EN Jr. Prog Retin Eye Res. 2004 23:307-80), which occur significantly slower for rods than for cones. We agree with the reviewer that, while bleaching adaptation is prominent in jawed vertebrate rods, it is not exclusive to rods. We have revised our text to convey the correct meaning that bleaching adaptation is present in SPs as it is in higher vertebrate rods and cones, but that recovery following bleach is slower in rods due slower pigment regeneration (Results, subsection headed “The single photon response of SPs is within the range of jawed vertebrate rods”, and Discussion, first paragraph). There is a fundamental reason that explains why SP-LP interactions are not described in the Current Biology paper: their analysis is limited to phototransduction in the outer segment using suction electrode recordings, while we also investigated downstream processing in the inner segment using the patch clamp technique (suction electrodes can only measure photocurrents generated locally in the membrane enclosed within the pipette). We have better highlighted our use of two different experimental approaches (in the Abstract and Introduction). Furthermore, we have stated explicitly that inter-photoreceptor signaling can be observed with patch clamp but not with suction electrodes (Results, subsection entitled “The single photon response of SPs is within the range of jawed vertebrate rods”). This section is a crucial premise for the single photons response analysis: if, as the reviewer convenes, migrating lampreys present a vitamin-A deficiency, then to correctly assess the sensitivity of rod-like photoreceptors all visual pigment must be first regenerated. Had we not done this analysis, our paper might have come to the opposite conclusion that lamprey SP photoreceptors do not perform as well as many other vertebrate rods! In line with our focus on SPs (and not LPs) the title of this section in our manuscript was “Bleaching adaptation (i.e. dark adaptation) in SPs”. e) We have given greater emphasis to our discovery that in lamprey SPs, as in jawed vertebrate rods and cones, bleached opsin seems to activate the phototransductive cascade (Discussion). Our exclusive use of the well-established variance analysis method to estimate the single photon response amplitude was explained in the original Methods section, where we stated that: “As in other rod studies in which a [the single photon response amplitude] was small relative to total recorded dark noise, we could not perform a reliable analysis of the single photon response with amplitude histograms. However, when both the variance and histogram techniques were employed, similar values of a were found (Baylor et al., 1979b, Baylor et al., 1984, Vogalis et al., 2011)”. 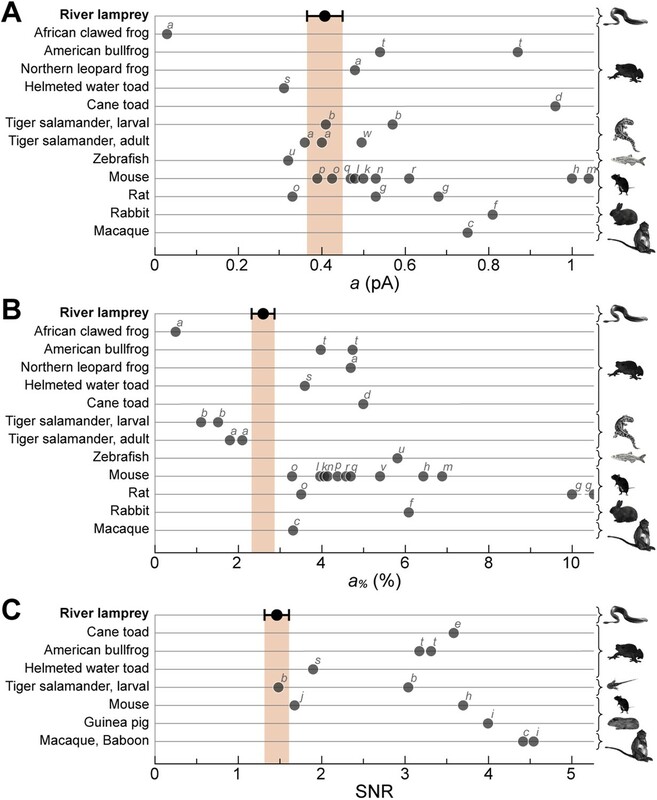 Notably, out of the 26 published estimates of rod single photon response amplitudes in jawed vertebrates plotted in our Figure 6A, only 6 originated from studies that also included an histogram analysis! Given that lamprey SPs have a signal-to-noise ratio at the lower end of the vertebrate range (our Figure 6C) it is not surprising that a histogram analysis was not feasible. Incidentally, not only did Morshedian and Fain not perform an amplitude histogram analysis, but they also do not show actual records of the variance analysis (as we instead do). We have included a reference to the above explanatory paragraph at the appropriate location in the Results. Also, we have added a mention to the 6/26 statistic just presented (Methods, “Data analysis and reporting”). […] In summary, the physiological data of the SPs and LPs of the northern hemisphere lamprey obtained by the authors are valuable. However, when these results are interpreted as a part of photoreceptor evolution, the presentation becomes murky. For this reason, I cannot recommend that the paper be published as it stands. We thank the reviewer for his/her detailed discussion of the evolutionary interpretation of our findings and for raising the important issue of when lampreys diverged relative to the diversification of visual opsins. We did not discuss this in the original manuscript and agree that it should be included. Our view is that the most recent literature does not provide support for the postulate on which the reviewer’s criticism is based. In fact, it has been hotly debated up to very recently whether the lamprey line diverged before, between, or after the two rounds of whole genome duplication (called ‘2R’) (Kasahara, 2007, Putnam et al., 2008, Kuraku et al., 2009, Mehta et al., 2013, Smith et al., 2013) that gave rise to the 5 groups of vertebrate visual opsins (Lagman et al., 2013). The possibility that the divergence occurred much after 2R was specifically rejected by Putnam et al. (2008, Nature, p.1069). Most importantly, the authors of the authoritative study reporting the sequencing of the lamprey genome (Smith et al., 2013, Nature Genetics, 59 authors from more than 30 institutions) state, regarding lampreys and jawed vertebrates, that the data is “consistent with the divergence of the two lineages shortly after the last whole-genome duplication event”. In summary, since the five groups of vertebrate visual pigments arose from 2R (Lagman et al., 2013) and the lamprey line likely diverged shortly after that (see above), it follows that lampreys are indeed a critical model for the understanding of photoreceptor evolution. We have significantly revised the Introduction and Discussion sections to improve our arguments for a critical role of lampreys in our understanding of the evolution of rods and dim light vision. In doing so we have integrated several of the reviewer’s suggestions. In particular, we now explicitly discuss the important issue of timing raised by the reviewer, presenting the most recent literature. We thank Prof. Luigi Cervetto, Profs. Ellis and Linda Cooper, for providing comments on the manuscript, Dr Brita Robertson and Prof. Peter Wallén for assistance with shipping the Swedish lampreys, Prof. Ansgar Büschges and Dr Christoph Guschlbauer for generously providing us the French lampreys, Dr Monica Mazzolini for suggestions regarding the suction electrode recordings, Prof. Mario Pellegrino for access to his lab's microforge, and Mr Francesco Montanari for technical assistance. Animal experimentation: All procedures involving the handling of experimental animals were approved by the Ethical Committee of the University of Pisa (prot. n. 2891/12) and were conducted in accordance with Italian (D.lgs.vo 116/92) and EU regulations (Council Directive 86/609/EEC). © 2015, Asteriti et al.